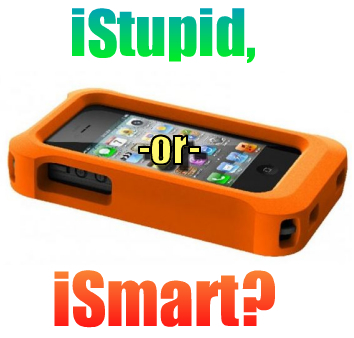 "Life-Proof" iPhone LifeJacket Case - Stupid, Or Super Smart? First of all, whenever I see big, thick, ugly cases made for the iPhone 4S like the Otterbox, I just shake my head. Why in the world would you want to wrap a gorgeous, thin, sleek phone in a big ugly brick-like case? I've never been a fan of the Otterbox, nor have I ever been happy that an iPhone requires the need of such a monstrosity. I myself have submerged and nearly ruined an iPhone. I decided that I could not part with my beloved iPhone 3GS when I went on a 4-hour float trip. I put my iPhone in a Ziplock bag (yes, that was stupid) and thought it would survive the trip. Well, it didn't. The bag took on water, and I almost ruined my phone. I also thought about how quickly I destroyed my iPhone 4 (within 3 months of purchase) and how devistated I was to stare at the ugly, shattered display. After breaking the device that I could not live without, I thought it would have been much better to have spent the extra $75 on an ugly Otterbox case rather than to stare at the horrid cracks running the length of the phone. The bottom line? The iPhone is far to expensive and fragile of a device NOT to put it in something that can protect it. It is not a rugged device, and was not made to survive active life. Therefore, you have to protect your investment. The LifeJacket looks like a joke, but it is shock-proof AND water-proof. If you're anything like me, water-proof is a great thing to have. I like to run, swim, bike, and play in the rain. I would much rather do all four of those things with my smartphone at my side than to do without. Therefore, the LifeJacket suddenly makes good sense. If I still had an Apple iDevice, this is something I would probably consider buying. Fortunately for me, I'm no longer stuck in the world of super fragile smartphones as I now own a super-durable Samsung Galaxy S2. But I would highly recommend that people check out the LifeJacket before they drop their phone. Furthermore, now that I have as much experience as I do in repairing iPhones, I can tell you that the quickest way to FUBAR your iPhone is to get it wet. There's no turning back once you burn out your backlight coil & IC chip. If you're an active person and you own an iPhone, give this a look and protect your investment. You won't be sorry the first time it takes a dive in the toilet. GET YOUR LIFEPROOF "LIFEJACKET" CASE NOW AT AMAZON.COM! Own an iPhone 4/4S? Protect that investment now with a LifeProof LifeJacket case on Amazon.com for only $45! It is shock-resistant and waterproof and made for active smartphone owners that don't want to leave their iPhones at home while they are out and about. It is far better to pay $45 now rather than $200 or more later. Be safe, not sorry... and get your LifeJacket today!